Following our 'fun crafting sleepover' at the weekend, one of my new Downlines stopped over a 2nd night, for me to help her with her Card Candy swaps she is joining in with at Stampin' Up! On Stage event in April. This is the first time Sandra (yes, another one) has created anything like this so, being very keen and with lots of my previous swaps to look at for ideas, work commenced. I think there were more punches out on my tables than in the pigeon holes on the wall !! 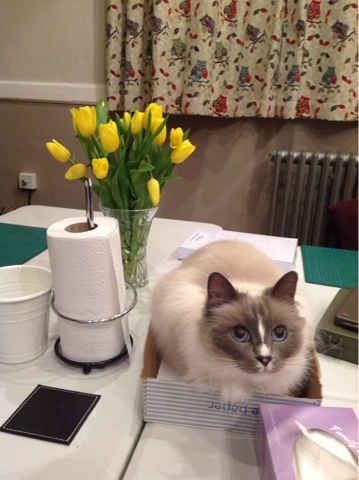 I'm sure Smudge has spent so much time with me crafting, she could make cards too, as she really wants to be in on everything going on in my Studio !! 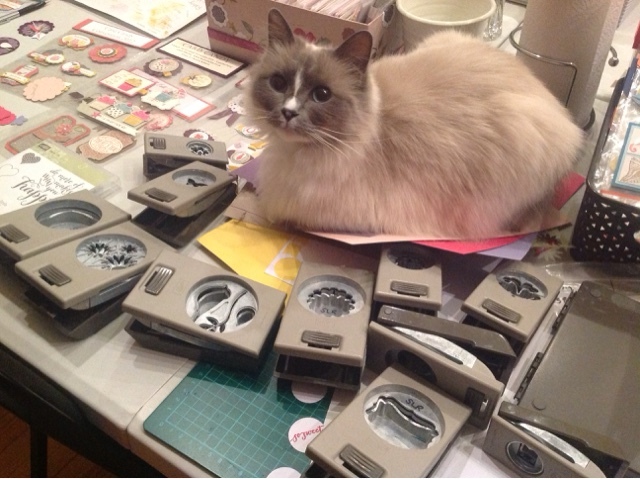 Sorry I can't reveal any pics of our craft pieces until mid-April, when swaps have been exchanged at our Stampin' Up! On Stage Local event for Demonstrators, in Telford, Shropshire. Bye for now, pop back soon. What a fantastic weekend !!!!!!! 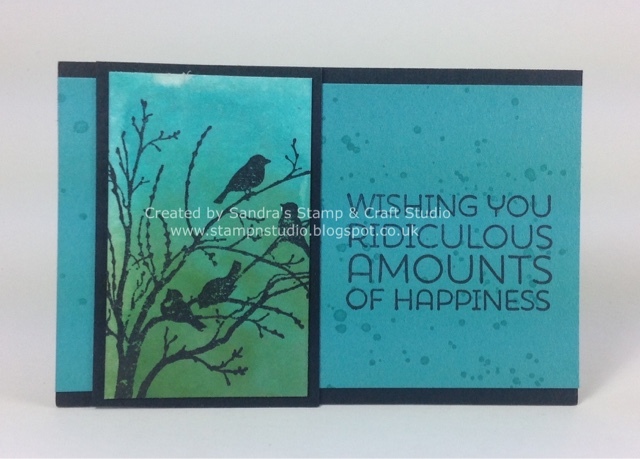 A bunch of fellow Stampin' Up! Demonstrators!, a belated birthday meal at Chinese buffet, lots of laughs, all back to my Studio for PJ's, cocktails, lots more laughs and a crafty sleepover, followed by a whole day of crafting together on Sunday. Now that's how weekends should be spent !!! Now, who's birthday can we celebrate next ? Can't wait for the next time girls. Today one of my dear crafting friends popped over for a long overdue catch up day, plus of course a spot of compulsory crafting ! Hillary was the hostess of my very first Stampin' Up! Party over 7-years ago, following a talk I had been asked to do at the local village Art Group. Hilary showed me a few lovely pieces she had been working on and we chatted over various inking techniques. Fitting in very much with my March "Watercolour & Inks" technique class, we decided to create a few pieces, which are now ready to make up into sample cards for my class. It was lovely having a 2nd opinion to consult with and whilst one technique was made with an old Stampin' Up! favourite, sadly retired, we decided on a lovely alternative for the class which is on my next order. Remember the handmade Business cards I've been making recently, well one small scrap of Watercolour paper wasn't going to miss out so this was another special addition to my slowly growing collection. 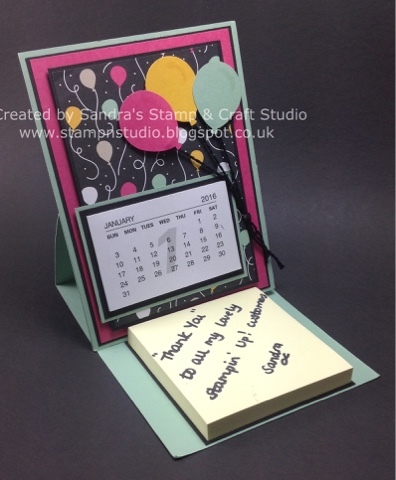 With lots of interest in this class, an additional date has been added so will now be held on Friday 18th and Saturday 19th March, 10am to 4pm, £30 including a lovely goody bag of Stampin' Up! materials to complete projects and take home to create more. Please pop back after 19th March for an update on the finished pieces. Our monthly Stampin' Up! Demonstrator Team Meetings are now regularly alternating between a structured all day Sunday training and a Wednesday evening shoe-box style swap, catch-up event, open to all our team, upline, Downline and sideways, plus other local Demonstrators in the area. 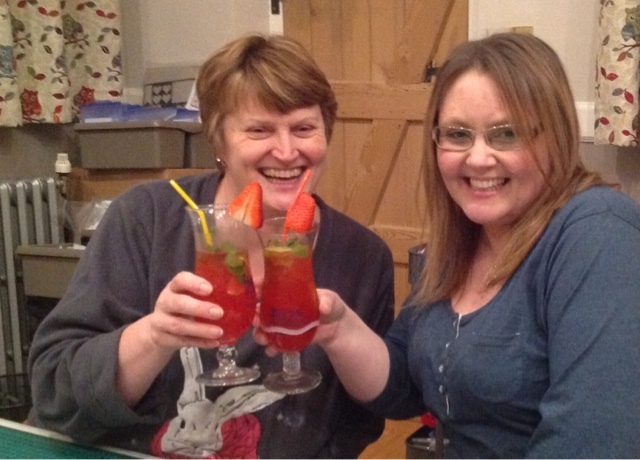 Last night those that could attend enjoyed a lovely relaxed evening, creating some lovely samples from the Spring / Summer catalogue. For my shoebox swap I shared a special project made for my January customers as a kit with tutorial. 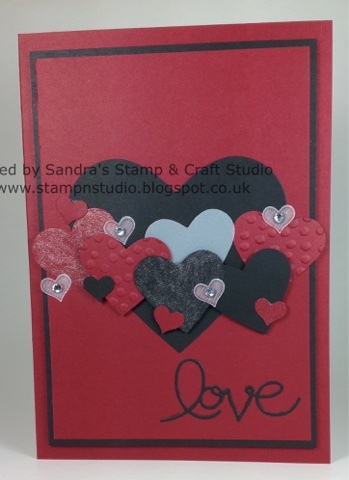 If you would like to make cards like this, please contact me for more details. Several of my classes get booked up from regular customers before they get advertised. The beauty of having my own ready made classroom, is that we can find a mutually convenient day/time to repeat classes. After a long day at work, I was looking forward to crafting this evening, here in my Studio, with some Stampin' Up! demo friends. 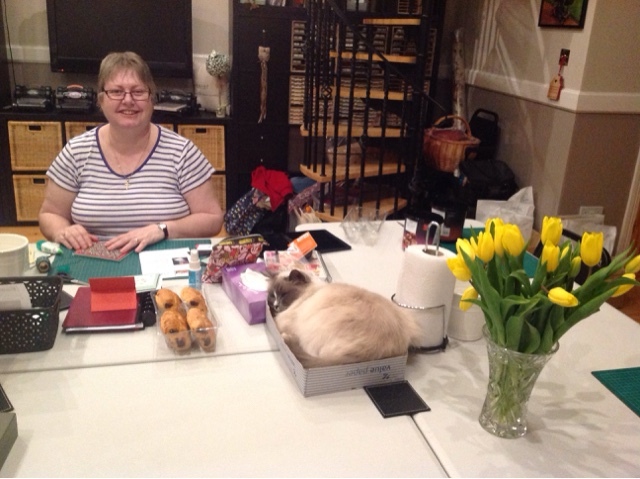 ..... and in Mums scrap paper box on the craft tables .... you didn't need any right now did you ? .... OK, so Dad's gone to bed, I'll curl up for a little nap too and watch Jayne from the corner of my eye. Now the other girls have all gone, I've grabbed another Cuppa and trimming more Make & Take kits for tomorrow in our local Town Hall at an Artisan Craft Market. Take a look at yesterday's post for the cute cards they'll be making. If you fancy joining in and seeing what other people have on their work desks, pop over and take a look here http://stamping-ground.blogspot.co.uk. I can't join in every week but pop along whenever I can. Being a late bod, it's usually when everyone else is tucked up in bed. Welcome to todays Weekly Deals from Stampin' Up! Add any of these weekly deals to a £45 order and you get to choose one FREE Sale-A-Bration product. Click on images below to link straight to more product information. You will also be able to order online and Stampin' Up! will deliver direct to your door. Remember to quote this months HOSTESS CODE is ~ B4S7DQFY. 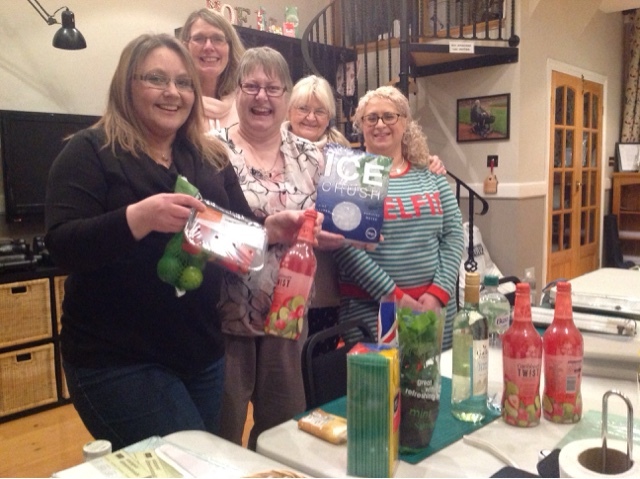 Not long after we moved to the village last summer, I was asked to be a guest speaker at our local village ladies group, who were planning their 2016 programme. With the weather during winter months being unpredictable, they try to arrange local guest speakers during these months. 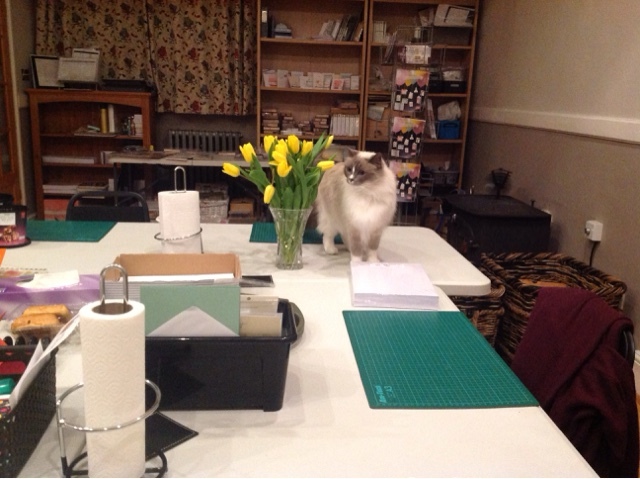 So, this evening I enjoyed meeting a smaller gathering of 17 ladies, delivering my talk on 'My Passion for Papercrafting'. After my introduction, I was fascinated to hear with some previous uses of The Studio part of our house, from the old primary school that we have the historic poster of, to a pottery running classes and also having been used as the village hall until they had the current Recreational Centre built. 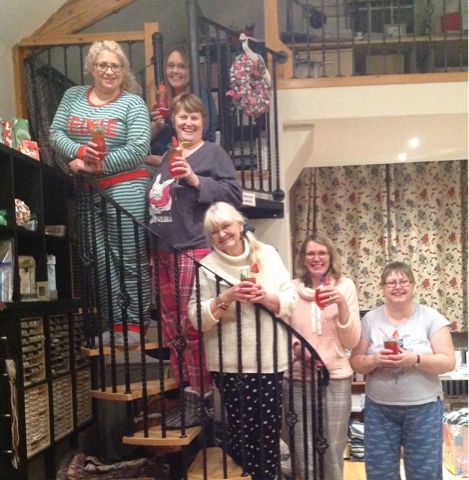 I walked the ladies through my background of various crafts since a very young age and joining Stampin' Up! as an Independent Demonstrator, talking through various techniques and samples on display. After gathering round the table to watch a couple of demonstrations, they chose my 'mini works of art' as Business cards to share with others friends and family who might also be interested in crafting. Next fun time, getting hands on with a Make & Take, working in relay, alternating with those having tea & coffee, all ladies thoroughly enjoyed creating some gorgeous cards they were all very proud of. 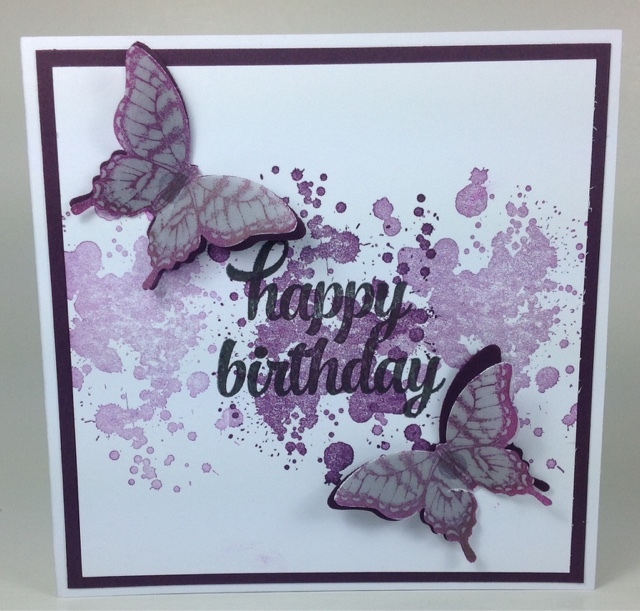 This card was a design I created for Thank You cards made for my 8-yr old niece and Gorgeous Grunge stamp set has been very popular with my customers this week. Remember that until 31st March, for every £45 you spend, you get to choose one FREE product. It's the perfect time to purchase products you've had your eye on, while earning more for free ! Today I'm sharing an enhancement to a project I've been working on over the last few weeks. 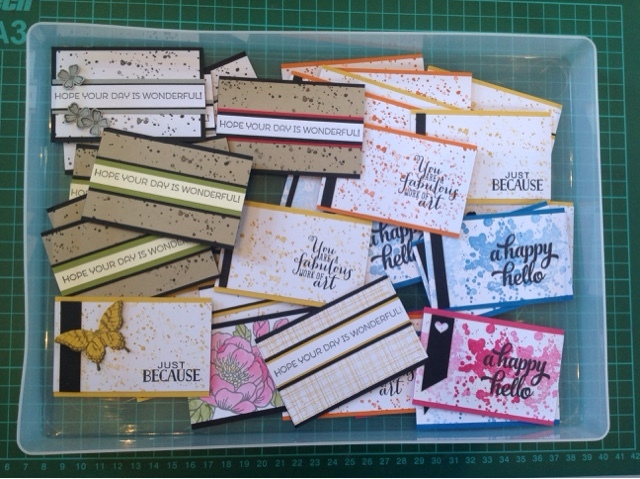 My earlier posts I shared how I've made some lovely business cards, cutting 10 bases from an A4 sheet of card then decorating using some of the abundance of scraps that accumulate on my workspace, whilst prepping classes, plus a bit of compulsory stamping of course ! This will definitely be an on-going 'work in progress' project to maintain supplies, but I am determined to clear scraps as I go, so this idea was born. As I finish cutting required sizes for class projects, the remnants left over, get cut neatly to required sizes or strips at the time. 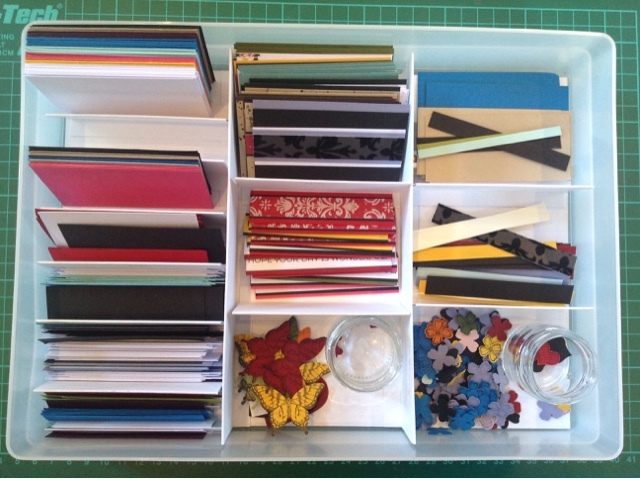 To store them all neatly, I decided to repurpose an A4 plastic box and cut an A4 size piece from 12" DSP backing card. Using more DSP backing card, I then cut, scored and folded some dividers. Having measured to space equally, I stuck to base card using red tacky tape for strength. Gorgeous Grunge stamp set is a firm favourite with lots of my customers. Here it provides really quick decorative backing to some of my business cards. Some of them also had small flowers or hearts punched from odd shaped scraps and stored neatly in the corner. Mini jam jars are also useful for keeping smaller elements together. I hope you gave enjoyed today's post. I know this has inspired a couple of demonstrator colleagues. Receiving a mini 'work of art' is more likely to be kept and remembered than a mass produced bought one. The only down side is the time factor, but if you prepare all scraps as you go, it really makes it much quicker and also a job that can be assembled on a lap tray in front of the TV with family. TECHNICAL HITCH WILL NOT WIN !! Apologies folks but I don't think this technical fault can be recovered, although I'm still hoping I hear something back from Blogger. When I updated three blog posts last night and scheduled a couple ahead, somehow, when I went to view blog, the whole of my blog posts fell off the system. Unlike last time, I am NOT going to ignore and go away, I am staying positive, because I am on a roll and I'm going to conquer negative little hiccups along my 100-day goal challenges. For starters, I'm going to rebuild those three posts from last night and continue forwards. Over the next week or so, when life is not so hectic (haa haa), I will try and pop on some quick shortened post of things I had previously blogged over last few weeks. Please bare with me until 'normal service can be resumed'. Sorry I have feedback in to Blogger to see why all my posts have disappeared. Hopefully, normal service will be resumed shortly. Here a quick back-post of hubby's Valentines Day card. I love Cherry Cobbler and Basic Black together. Here I've also used a couple of retired products with the Sweetheart punch #133786 and mini heart from Itty Bitty Accents Punch Pack #133787, adding a touch of Wink Of Stella #141897 to add a bit of glitz.